I have never been much of a fiber person, let alone knowing what farm-to-fiber really means. My repertoire consists of a few simple knitted scarves and a bunch of half-finished projects. During these brief crafts, I didn’t pay any attention to where my yarn was coming from. That was about to change! I jumped into my first day with much anticipation. Tying on my apron, I was excited but admittedly a bit nervous since the fiber world is so foreign to me. Not a stranger to learning new things, I was confident I would pick it up. Sure enough, I did, after my trembling fingers finally got the hang of tying slip knots onto the skein weaver. That was my first task. 27 skeins later I finished with a flourish and was eager to learn more. 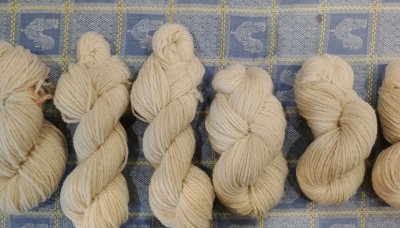 During the next few hours I picked and conditioned fiber to my heart’s content, all the while gawking at Susan as she skillfully tinkered with the spinning machine, working 12 bobbins at once, and Kristen washing and smoothing each skein to perfection. The entire process was mind-blowing and surprisingly fun, and I didn’t even get a chance to see all the machines in action. Standing there picking locks gave me a lot of time to think, and as I did, I started to understand what “farm-to-fiber” really means. It means working with the farmers down the street to transform their beloved sheep’s wool into something beautiful. And, in the mill, it means referring to that wool by the animal’s name. How sweet is that?! “Farm-to-fiber” is a process filled with love and feels like home.